Have you ever looked at a recipe and thought that it looked pretty good, but then after you read the description, it sounded really really good? 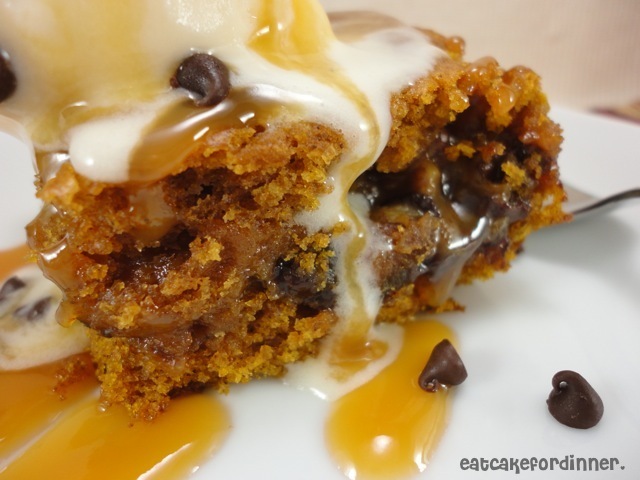 Well, that is what I did with these pumpkin blondies! I read the name and saw the picture a few days ago and didn't think anything of them, but then I saw them again and realized they didn't just have caramel in them, but they also had chocolate and pecans! SOLD! I made them that night! These are soooooooo good! 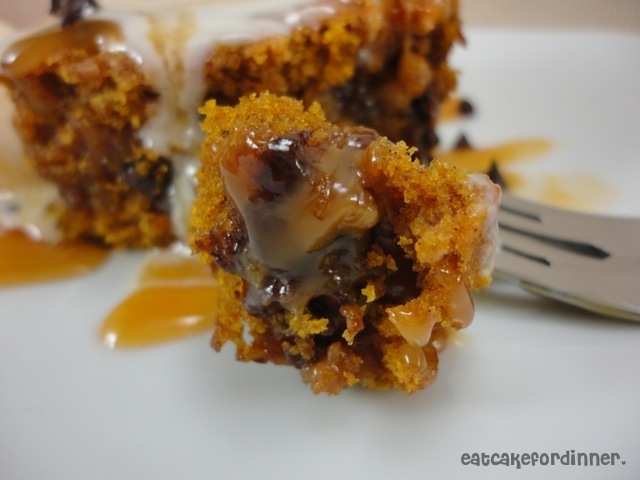 You should really get up and make these tonight! 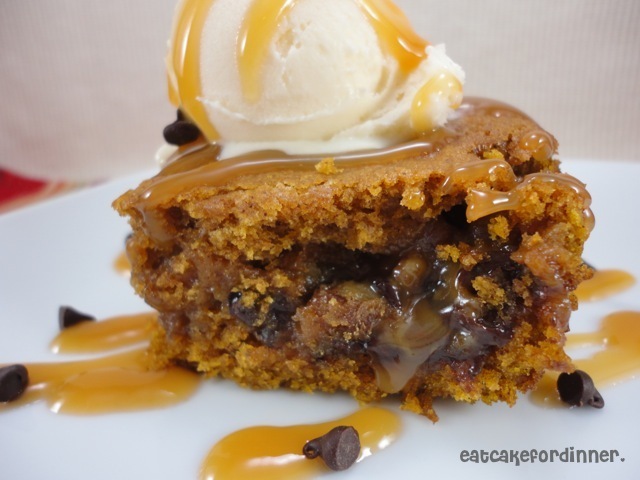 I served the blondies warm with vanilla ice cream and more caramel sauce! I am really loving warm desserts with cold ice cream lately! It must be the Fall weather? Do not leave the pecans/walnuts out (unless you are allergic, then please do! ), they added such a perfect balance from the sweet caramel and chocolate! Next time, I will add more pecans! Preheat oven to 350 degrees. Grease 9x13 inch pan; set aside. Cream together butter and brown sugar. Add eggs, vanilla and pumpkin puree and blend until combined. Slowly add cinnamon, nutmeg, flour, soda and salt. Spread about 2/3 of the batter into pan evenly. Sprinkle chopped nuts and chocolate chips over the top. Microwave the caramels and heavy cream until melted, stirring every 20 seconds. Pour over nuts and chocolate chips and spread evenly. Dot remaining batter over top. Try to spread dollops out. It is okay if some of the caramel peaks through. Bake 25 minutes or until a toothpick comes out clean. It might have caramel on it, but it shouldn't have cake batter. Serve warm (might get oozing caramel) or cool completely. Serve with vanilla ice cream or whipped cream. Jenn's Notes: I cut this recipe in half and baked it in an 8x6 inch pan and baked it for 30 minutes. This was really good. It is dense but soft, chewy and moist! Next time I will add more pecans and possibly more chocolate! I loved this warm and I loved it at room temperature. I let it set for about 10-15 minutes when I took it out of the oven before I cut into it and I didn't get any oozing caramel, it held it's shape really well. Hey I tried following you but some maintence with the site, but would love for you to follow me than I can follow you when it's not being "crazy" lol thanks so much :) have a great day!!! Oh My Heck!! These look amazingly delish...think my pants got a little tighter just after looking at these!! I want to lick the sauce right off the plate! I just discovered your blog. Love it! thanks for all your great recipes and hard work. YUM!! I put these on my FB page and pinned them, too! :) Thanks for linking! This is fabulous. If you are going to put ooey gooey on a recipe, it had better be good and this one looks better than good. I just printed it up. I wonder how many people who see this at the linkys are going to come running. I know, I was here in a flash. Thanks for sharing with Bake with Bizzy. Bizzy is learning from you. Ps. Just pinned this recipe to my Pinterest! YUM! These look super delish! Oh my heaven. Thanks for linking up at A Little Nosh this week! Saw these on Sweets for a Saturday - these look so good! I'm with you on warm desserts with ice cream, nothing better. Ummm, these ooey gooey look delish. Pinned to my pinterest. Gosh now I have a taste for some treats. Sharing is a good thing, and we all need to know how to make, would you post at Sunday's Best, a giveaway for a kitchen aid hand mixer is also going on. I may or may not be licking the computer screen right now! ;)It looks soooo good! So making it a feature in tomorrow's Show & Share! Hope you'll come grab a button! I tried this recipe and it was delicious! Thanks so much for posting it.